Dreamees: One for the men! Twice in one day - wow, I'm on a roll! 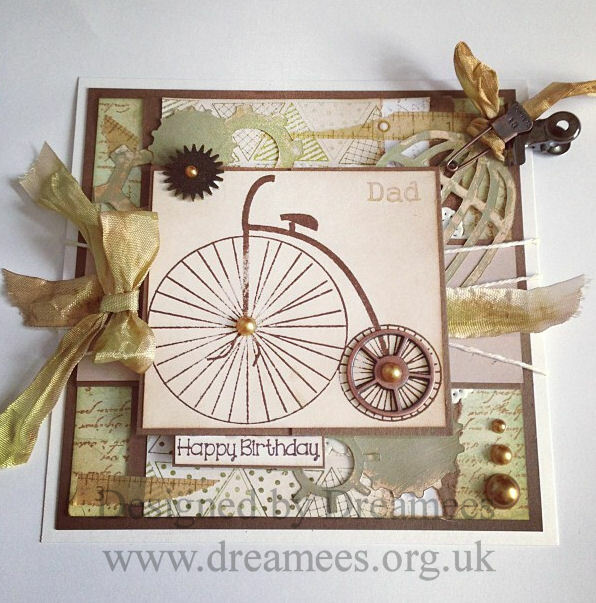 The topper image is our Penny Farthing - I've only used it for female, flowery cards up until now but it can be a very manly image! I've used some Crinkle ribbon (now sold by the metre), inking it with Gathered Twigs distress ink pad and Old Paper distress stains. On the birdcage, I've tied a ribbon (made with Crinkle Ribbon) through the top, used a Trinket Pin and a Hinge clip to embellish. I've used some Sprocket Gears in the middle of the smaller wheel and the top corner of the image. and the word Dad was made using our Alphabet set! We got so many likes on the facebook page that I thought I should blog it!